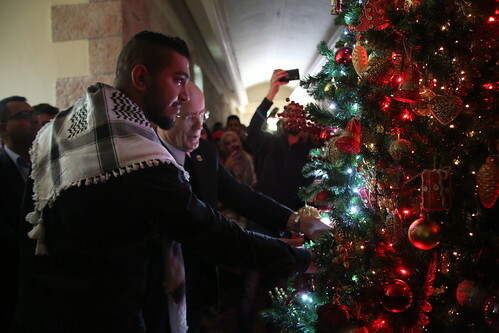 Bethlehem University held its annual Christmas tree lighting and Christmas party on Thursday, 29 November 2018. The ceremony took place in De La Salle building where dozens of students, faculty and staff gathered. Vice Chancellor Brother Peter Bray wished Bethlehem University community God’s blessings this Christmas season. Brother Peter and the Student Senate’s President lit the Christmas tree. The audience reacted with cheers and joined in singing Christmas carols. The Dean of Students Office also organized the annual Christmas party in cooperation with the Student Senate afterwards at the auditorium. The party was held in the auditorium and included question and answer competition in addition to performances by Wajd Musical Group and the Shepherd’s Boy and Girl Scout Troop.